Today we are blog stopping for the amazing author Devyn Dawson and her novel Enlightened! Look at that cover! (Below) Isn't it beautiful? Not just is the cover beautiful but the novel also sounds awesome! 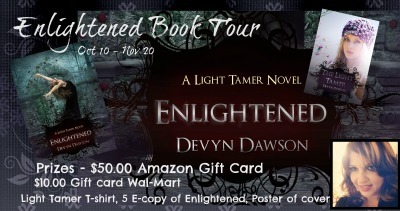 Devyn is also featuring a giveaway during the tour which you can enter below with the rafflecopter. Devyn is a full time writer, wife and pet owner. She's been writing since she was a small child. 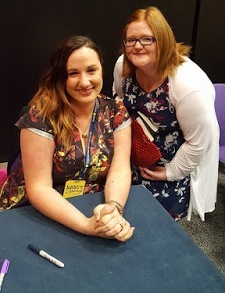 Her first office job was working for a publisher and data entry of manuscripts. She literally typed them and saved them on real 'floppy discs'. When she was in high school back in the 80's, she would read Stephen King one day and Sweet Valley High the next day. She said one day she'd find a way to merge the two books. Currently Devyn and her husband of 19 years live in New Bern, North Carolina. Devyn is originally from Oklahoma City, Oklahoma and still refers to it as home. She has two adult children, Paris and Hunter. When she realized she would be facing an empty nest and family so far away, she decided to write about characters to entertain her. Her new series The Light Tamer, is about friendship, relationships and falling in love. 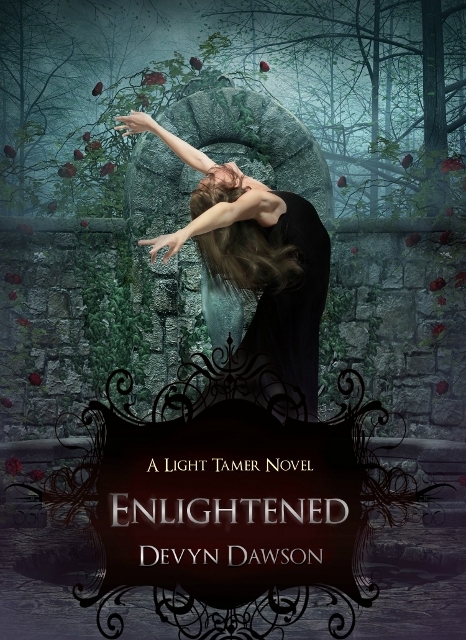 The Light Tamer series is a younger young adult book, the one that takes you back to the beginning before being jaded. It offers characters that are both good and flawed. Throw in some mythology and you're in for a quick trip that will leave you breathless and enlightened. You can follow Devyn on Twitter here and facebook here. Jessie Lucente, a Light Tamer, has started her junior year at Parca Academy in New Bern, NC. She has a new boyfriend, Caleb Baldwin. He is beyond good looking, he is her mate for life. They've been bound by the light and will rule and heal with it too. Her new classes aren't what she expected. Finding out the school is filled with 'gifted' kids is almost too much to comprehend. She finds out what it really means to be a Light Tamer. Some of the assumptions she had are debunked and now everything is crystal clear...well, clear as mud. Now that she is enlightened with the facts, she struggles with the truth. Thorne Woodson has all of the girls swooning. His Doc Martens and hoodie stand out against his school uniform. He might be the guy to heal Amber's broken, grieving heart. What's his story, and why does he appear everywhere Jessie is? He has a secret that will change the game for everyone. Who is he in cahoots with? Amber starts her junior year with a bang and a huge crush. She has a point to prove on the first day of school. She refuses to let everyone believe she went soft over summer break. Her shenanigans end with detention on the first day. The anniversary of her brother's death has her making dumb decisions but her friends have her back. Jessie will struggle to help Amber deal with the grief. The secrets that have been revealed by Fate will leave Jessie in a new role. It will all come down to bloodline versus logic. She must step up and embrace her new title, and life on the other side of the shimmer. With her small army together, they promise to vanquish Nyx back to the Underworld and seal the portal she came through. The second book in The Light Tamer trilogy will answer the questions that are burning in your head. A beautiful tale of first love and friendship. Be prepared to be amazed at the twist in this story. You didn't see it coming, but you'll be glad it did! Doesn't it sound uh-mazing? What do you think of it? My favorite love song is probably You and Me by Lifehouse.